Why am I doing this? What is driving me to get rid of stuff that I have had for decades? Yesterday I decided to get rid of things that I have had for 20 years. I’m sure that there are older items yet to come. Simply put, I have finally come to the realization that stuff does not equal happiness. Oh, I’ve known it in my head for years. But I didn’t really understand it. It was one of those things that “everyone knows” but that no one ever follows. I was dissatisfied with something in my life and felt that the next knick knack or doohickey would bring me happiness. But now all this stuff does not support what I want to do or who I want to be. As I said in my very first post – Jules and I want to get a tiny house but we own too much -some people would say it owns us- and would never fit into a tiny house. We talked about getting a storage unit but that seems like it isn’t the right solution. Oh, we will probably have one for seasonal items, like camping gear or winter clothing, but there is no need to store things away forever. Now we might not end up in a tiny house. We might just move into a small apartment. Either way we cannot do that until we have less. Our stuff requires space in the form of a storage unit or a large apartment and that costs money. Prisoners of our possessions. On top is a food mill. I used to make chile sauce out of various dried chiles I found in a local market. It was fun and the sauce was very tasty. But it went bad before I could use it all and I never started canning like I wanted to preserve it longer. Someone will use it. The other is a bin full of nail polishes. Some of them were mine from a period when I actually used them. Some of them were presents. Some were left to me when roommates moved out. I think I’ve worn nail polish once in the last 4 years – and it wasn’t one of these. It isn’t easy to change a habit. The ingrained autopilot routines can catch us when we’re not paying attention. Just grab the remote and start channel surfing; pop open the laptop and play games; pick up the phone and check social media. We have to put stuff in the way of those easy paths if we wish to change. Not because those habits are bad but because they impede us from being who we want to be. 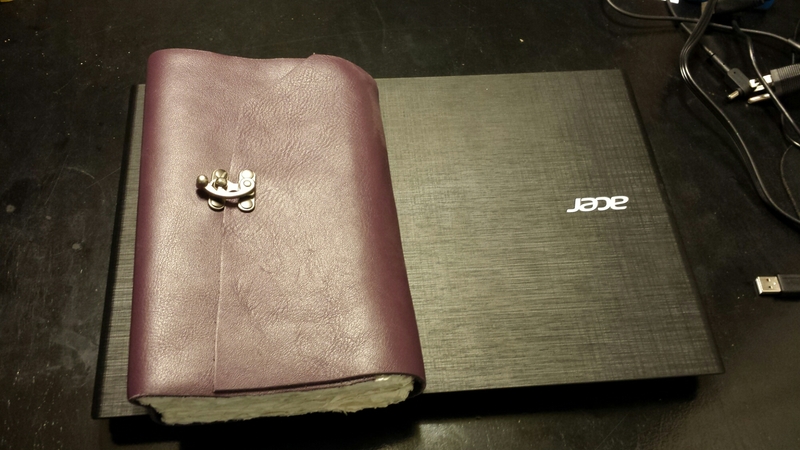 That is a leather bound notebook of hand made paper. I bought it months ago, wrote in it once, then left it on a shelf. I would see it and think that I should write something. The notebook now resides on my laptop. I have to consciously acknowledge the notebook’s existence and purpose every time I turn on the laptop. And in the past few days I have written more both in and out of that notebook than in the past year. Will I keep up this pace? Who knows. I will be getting back to other things in life that mean something to me. And I’d rather choose between meaningful things than meaningless things.